Displays a palette with controls for slicing the selected layer into a grid. 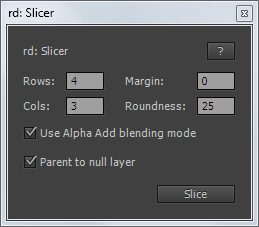 Slicing works best with non-rotated layers. If a parent null layer is created, it will be anchored at the layer’s current anchor point. 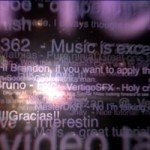 Note: This version of the script requires After Effects CS5 or later. It can be used as a dockable panel by placing the script in a ScriptUI Panels subfolder of the Scripts folder, and then choosing it from the Window menu. Added small UI tweaks for CC, and cleaned up some code.